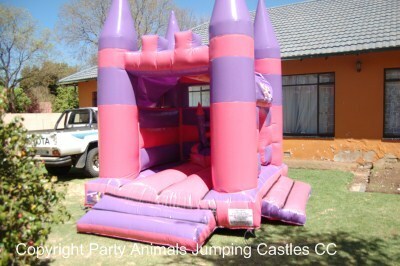 The Mini Princess Castle has proved to be a huge success with girls parties from ages 2 to 8. The main reason is that the colours appeal to various themes including Princess and Fairies, Barbie, Bratz or even Princess Fiona from “Shrek”. This castle is also suitable for smaller gardens and complexes’ where space is limited. The Throne allows the Birthday girl to enjoy the limelight and focus of the party. The roof provides welcome shade against the summer sun and makes the castle cozy in winter. The motor is a .75kw motor with a 15m extension lead. If your power point is further than 15m from where the castle will be placed, you will need to supply an additional extension lead. These are not supplied by Party Animals. All motors are provided with a rain cover.